The following are two posts from the “United We Blog” commentator. The first one is the most recent one. 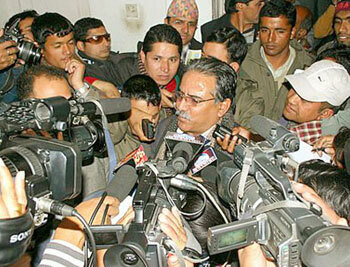 Emerging from the interaction, CPN Maoist Chairman Prachanda told reporters that the conference was in fact the roundtable conference his party had been demanding. Interesting remarks by the comrade! So that was what all Maoist hue and cry of round table conference about? According to reports, an interaction program was organized this afternoon that was attended by a handful of ‘prominent’ civil society members and Seven-Party Alliance leaders. During the interaction civil society personalities urged the SPA to stand united to hold the Constituent Assembly (CA) elections within the current Nepali year (mid-April 2008). Senior leaders of the major factions of the SPA who took part in the interaction program said that they took the suggestions positively. The RCP did their annual round up of the year in pictures in this issue of their newspaper Revolution. Go look. And there is no mention of other Maoists of the world at all (that I could find). two undertrials were injured during firing and clashes. jail guard inside the prison and snatched his weapon. 375 km from the state capital, which is located in a naxal infested area. (12-02) 04:00 PST South Bastar, India — Two years ago, Comrade Sunil spent his days studying in a school classroom and toiling in corn and rice fields in his ancestral village. But life abruptly changed one night after he returned to find his home torched and his older brother shot dead by a state-sponsored civilian militia on the pretext that he had been a rebel sympathizer. Now, warming his hands by a campfire deep in the mountain jungles of southern Chhattisgarh state, the 18-year-old member of the People’s Liberation Guerrilla Army promised never to give up the homemade rifle lying on his lap.